1. Marinade the steaks with the sour orange, garlic and onions at least one hour in the refrigerator. Even better if you can marinade it overnight. 2. 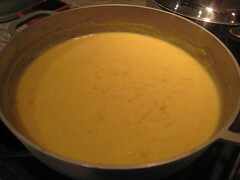 Melt the butter in a skillet over high heat. 3. Brown the steaks on both sides in the butter. 4. 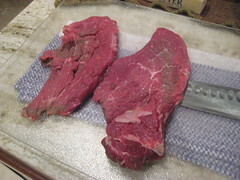 Sprinkle salt on each side of the steaks and continue cooking to your preferred doneness. 5. 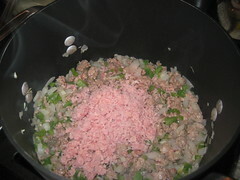 Remove the steaks and without cleaning the skillet, add the onions and remaining marinade to the skillet. 6. Cook through until the onions are golden and tender. Serve steaks with cooked onions on top, or as a side dish. 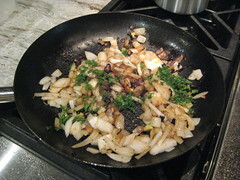 Steaks can also be served with raw, chopped onions and parsley on top. 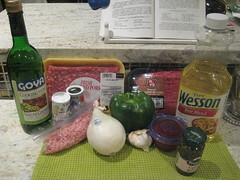 The first recipe in the 50-recipe beef chapter is good ol' Bistec a la Plancha, otherwise known as Cuban steak. At least I think that's what it is. Once I sat down to prepare for this recipe (remember, no on the fly cooking with Nitza as she's always throwing curve balls at the end of her recipes), I read through the ingredients and made my grocery list. 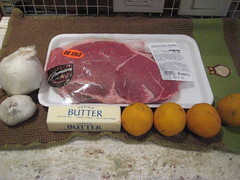 Easy enough - one pound palomilla steak, naranja agria (sour orange), butter, garlic and an onion. I've never been good with identifying cuts of beef. T-bone, NY strip, flank, skirt, ribeye. To me, if it has chimichurri sauce on it, it's churrasco and if it's thin, it's palomilla. If I need help past that, I consult my beef dictionary (aka my husband) that knows how to describe cuts of beef in my language. And if it's the smallest cut on the menu and says "petit", I go with it because at two points per ounce (for Weight Watchers POINTS), I need the most petite there is. It wasn't until I had gotten home from Publix that I realized that (a) the recipe didn't call for palomilla, but rather filete del centro, whatever that is, and, (b) the palomilla steak I had bought was the wrong cut. It was thick! Who does that? If it says palomilla on the outside, why would they put a thick-cut steak in there? I figured that if I butterflied the steak, I'd make it thin enough, but since I had never really butterflied a steak and only heard about people asking for that to be done to their thick steaks, I didn't know what I was getting myself into. I took my knife and tried to slice my way into making palomilla cut-like steak. It worked, but I ended up with some small steaks and some ripped pieces of meat and a couple of decent thin steaks. What a mess. It would have been much easier to just make sure I had the thin steaks I needed before leaving Publix. New note to self: check steak cuts and ask dumb questions from the butcher to make sure you're taking home what you need. The rest was easy. I drenched the steaks with the naranja agria and covered them with chopped garlic and onions. 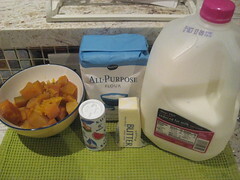 Left them in the fridge while I prepared to bake some left over french fries from a fancy French restaurant (blasphemy! gasp!) and set the table. It was a Monday night, folks. Not much time for anything but reheating side dishes. Melted the butter over high heat and when the pan was screaming hot, I placed the steaks in, two by two. 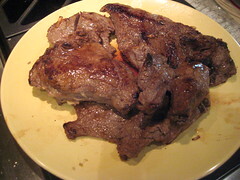 The marinade, as well as the onions and garlic would caramelize and the outside of the steaks would turn a golden brown. It was tough to get the inside cooked through because all the cuts of meat were so varied, but as I got to the last cuts, I had done much better than the mostly bloody rare first ones I had cooked. 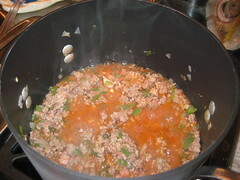 All in all, easy recipe that doesn't require much prep work, except for having one pound of thin steak ready and maybe chopping up the garlic and onion the night before. I've heard that actually marinating the palomilla with the naranja agria overnight makes the steak tough, so don't super-prep and just marinate it for one hour, or for as long as you can without stopping progress in your kitchen. Oh, and what to do with the onions, garlic and juices left in the container you marinated everything in? By adding a little more butter to the pan and mixing it in with the stuff left behind by the steaks, tip in the container and some chopped parsley and you've got certifiable cebollitas for the topping on your steaks. A crowd pleaser, that's for sure, and instant Cuban house smell. What more can you ask for? An accurate labeling for the cuts of steak, is what I'd ask for, but after this process is done, I'll be speaking carnicero (butcher) language in no time.